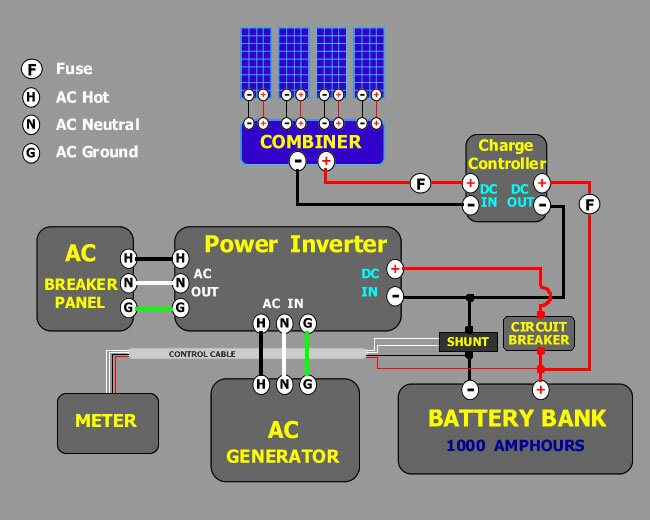 Click the 3 buttons below for examples of typical wiring layouts and various components of solar energy systems in 3 common sizes: 2 KiloWatts, 4 KiloWatts, and 8 KiloWatts. These system sizes are based on 100 watt solar panels and 5 hours of average daily sunshine. This is explained in greater detail in our tutorial on Solar Radiation. Of course, under actual operating conditions a solar power system does not produce full output every day. * Note: based on 100 watt solar panels and a 5 hour solar day. DISCLAIMER : Alway make sure that all of your equipment is properly fused and grounded for safety. Also, be sure to read and follow the advice and instructions that come with your equipment. These example diagrams, while reasonably accurate, are not meant as a substitute for the recommendations of a licensed electrician. These examples are a guide only and are meant to demonstrate how typical system components are connected together.